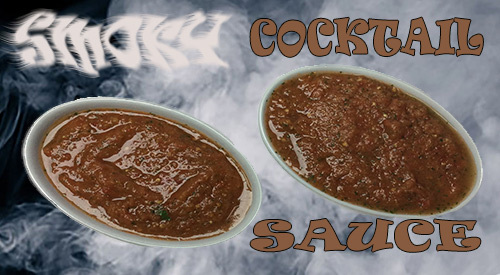 Smoky Cocktail Sauce is very easy to do by simply smoking the Tomatoes for the recipe! You’ve seen me use the Orion Cooker before for cooking and smoking more traditional items. Now, see how I produced a great hot smoked tomato using a blend of Sugar Maple and Wild Cherry wood chips to bring subtle smoke flavor. Once smoked, I take the smoked tomato and produce a smoked tomato cocktail sauce that has so many uses. I like to smoke food items that take 40 minutes or less on the Orion Cooker that has been used first for a longer protein cook. Remember, this cooker is a convection cooker so the heat retention can’t be beat. It’s just perfect for our plum tomatoes which can be smoked in 30 minutes or less. Simply take plum or on the vine tomatoes, and cut in half. Place directly on the grill grate. Use the residual wood chips and briquettes already in the Orion Cooker to smoke the tomatoes. Once smoked, remove and use in your favorite recipe or store in the refrigerator for later use. With the tomato halves smoked, it’s time to gather the other ingredients needed for our Smoked Tomato Cocktail Sauce. In addition to these ingredients, you’ll also need a food processor. Tomatoes, honey, prepared horseradish, chipotle in adobe sauce, Worcestershire sauce, lime juice, cilantro leaves, salt, and fresh ground pepper. Add just a touch of olive oil. Process all the ingredients until slightly smooth in consistency. Remove, and place in a serving bowl or you can store in an air tight container in the refrigerator for up to 2 weeks. There are two distinct flavors that work so well in this unique cocktail sauce: spicy chipotle and smoky tomato. Combined with the freshness of cilantro and lime juice, a beautiful balance of flavor develops that makes this perfect as a dipping sauce for calamari, shrimp or used as a sauce on your favorite fish. I’ve had guests who simply want to treat it like a salsa and scoop up some sauce with tortilla chips. Whatever you decide to use this smoky cocktail sauce with, you sure won’t be disappointed with the flavors. Remember too, you can smoke the tomatoes in the Orion Cooker, on a charcoal grill, on a gas grill with wood chunks, in a stove top smoker pan, or even with a handheld food smoker. The choice is yours for the same easy, great flavor.